In the “near future,” technology has made undersea colonization a way of life. The United Earth Oceans organization was created to keep peace in the seas, and the SeaQuest is their flagship. A submarine the size of an aircraft carrier, SeaQuest represents the most advanced (and most impractical) submersible ever built. The first season of the show had the crew pursuing scientific missions, making archeological discoveries, and preventing ecologic disasters. Admirably, this is much of what you can expect out of the console game. Blow up pirates in the overworld for cash. Taking the popular format of a “training simulator,” you’re put in command of the SeaQuest as a junior officer. The game is divided into three ocean zones, each accessed sequentially as you raise your rank. Each ocean zone has three to four missions you’ll need to complete, ranging from stopping nuclear reactors from going critical to foiling local pirates. There are also a limited number of mining zones where you can optionally collect treasure to increase your funds – more on that in a bit. Ocean zones are traversed in a 3/4 perspective overworld. 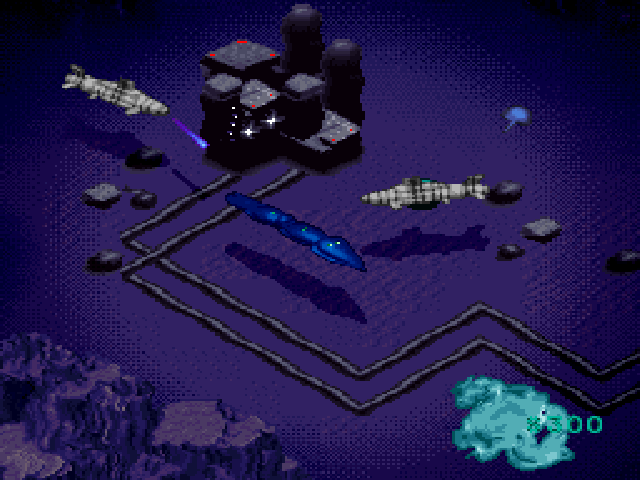 Here you chug along as the mighty SeaQuest, avoiding sea walls, enemy submarines, and the occasional mine or turret. SeaQuest can launch about eight different kinds of torpedo from its forward tubes, or drop mines and countermeasures out its back. You have two dedicated firing buttons, and can customize what they shoot at any time. Homing torpedoes lock their targets with the shoulder buttons. You also have the ability to raise and lower the ship among three different depth levels with X and A, allowing you to line up a shot or to duck incoming torpedoes. It gives an extra level to what is otherwise completely standard combat. When you’re in range of a mission zone, you can head to the launch bay. 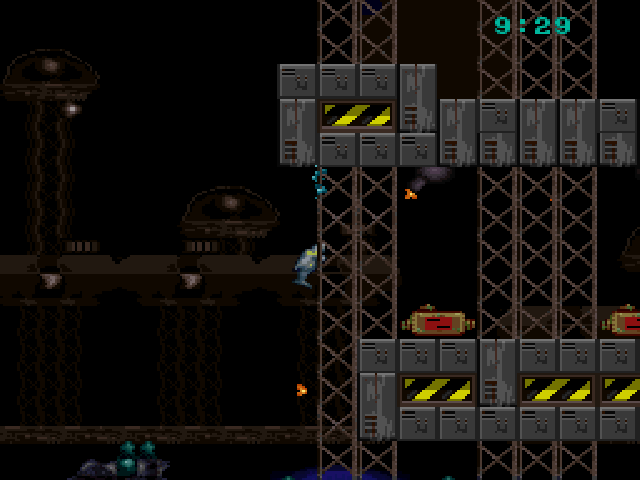 Missions are always side-scrolling affairs, and always completed with six mini-subs launched from the SeaQuest. Every one of these (near as I can tell) is taken from the show, and each has unique capabilities and handling characteristics. The HR Probe can flip switches and carries a welding torch. The Stinger is the only ship that can rotate and fire 360 degrees, and is needed for clearing out things above or below. The Truck is a beastly combat unit, and is one of only two ships that can pick up cargo. The Crab has no weapons, but can drill, rescue survivors, and blow away sand with air jets. Finally, Darwin the Dolphin is weak and unarmed, but is so fast he can rocket past turrets before they can turn to track him. The Stinger can rotate and fire. You’ll need to use a combination of ships to complete missions. At the most basic, you’ll need to send in a combat ship to clear the area before one of your unarmed support craft can do what needs doing. As things get more complicated, you’ll trade off between ships multiple times in the level as you open a path. There are also places some ships can go that others can’t, due to their size or surrounding “danger” – e.g. both the HR Probe and Darwin can flip switches, but the Probe can pass through plasma jets that would scorch the dolphin. Switching craft is simple as returning to a beacon back at mission start, and any progress you’ve made is kept. However, any damage a ship has taken is not repaired, and it doesn’t seem you can abort a mission once you’ve committed to it. This is where the money comes in. You start with one of each craft type, and if you lose any, or want extras on reserve, you have to buy them. Ammo used in missions is infinite and free, but all your shots in the overworld come from a finite stock. If you fire all your torpedoes, or want to stock up on some more expensive homing varieties, you have to buy them. The occasional mission also penalizes you for destroying parts of a friendly colony’s security system – even though it’s shooting at you, you’ll have to reimburse them the cost – and should one of your errant torpedoes happen to nuke a facility in the overworld, well, you’ll be paying for it. Luckily, money isn’t too hard to come by. You earn a few hundred for sinking pirates in the overworld, you can supplement your income with mining missions, and cash bonuses for completing missions are all generous enough to keep you stocked through normal play. Your weapons also get reloaded each time you graduate to a new ocean zone. It seems like a bit of a hassle for a commander of a military vessel to have to cut checks for every piece of equipment he uses, but it does add some extra challenge (in those “don’t blow up the colony’s stuff” missions), and is handled fairly overall. Here’s another maze that you get to navigate in the dark this time. In fact, the whole game structure is surprisingly creative, and quite true to the show (the first season, anyway). You’ll be securing atomic bombs from a crashed Cold War bomber, patching up leaking holes in a sunken oil tanker, and stopping eco-terrorists from blowing up a battleship. It’s the kind of peaceful, ecologically-minded stuff that NBC executives feared made the first season boring, but it actually keeps things unique, and the light puzzle nature of each mission keeps you thinking. I really enjoyed swapping out my specialized tools to get the job done, and rarely felt that aspect was a burden. If nothing else, this isn’t the lazy, side-scrolling shooter cash-in it absolutely could have been, and I appreciate that. Unfortunately, the difficulty in this particular version gets extreme, possibly to make up for the relatively short length (only 13 missions total). 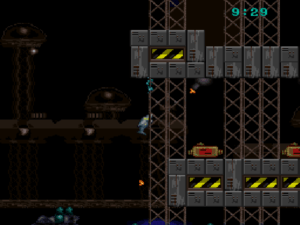 Most levels are designed as elaborate 2D mazes, forcing you to wind through gauntlets of turrets or other defenses, avoid dead ends, and try to find your objectives. 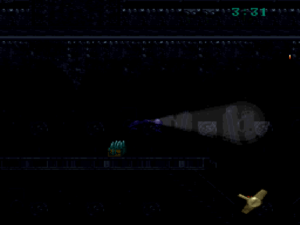 Most missions further include a time limit, with failure resulting in a hard Game Over. 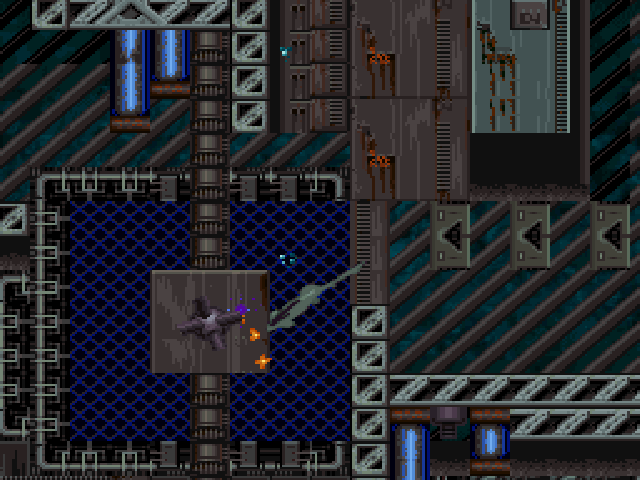 While the mission brief gives you a good idea of what you need to be looking for, you have no time to actually explore the levels and find the correct paths – the 10 minutes you’re given is always cutting it close just to complete the tasks, and I can say with confidence that no one will be able to figure out many of the later levels on the first try. Even if you’re quick, levels like the haywire security system or the bomb defusal task are designed with necessary trial and error to get the right sequence. These issues are nothing compared to the game’s most egregious problem – in the SNES version, you only get passwords for the start of each ocean zone. You cannot save your progress within the zone, and failing any of the missions doesn’t just restart you at the beginning of the zone, it restarts you at the mandatory mission that introduces the zone. For the second zone, you have to charge the Speeder past a network of pirates waiting in ambush. For the third, you have to navigate Darwin through an enormous reef maze and reach a bomb in two minutes. Again, using a password forces you to play these missions over every time, and only then start from the beginning of the zone. Darwin needs to figure out the correct switch pattern, while under fire. It’s inexcusable, especially considering that the Genesis version gives you passwords after completing each mission. Especially strange is that there are mission passwords, but only for a “training” mode that kicks you back to the menu after completion. Playing legit, I can only assume you’re meant to poke at each mission and take notes – marking down the correct code for each group of security switches, learning the paths, slowly figuring out the early steps to get you in a little further, until you can execute it perfectly. It would certainly stretch out the longevity of the game – if you’d even be willing to put up with it. Yet even with save states, I found myself reloading earlier in the mission closer to 40-50 times due to all the trial and error eating away at the nefarious time limit. Asking you to play each mission that many times just to figure it out is getting laughable. The menu system is a bit counter-intuitive as well. In the overworld, the Select button takes you to the bridge menu, where you can enter passwords, look at a map, or read mission orders. This is a click-driven interface, so you’ll have to steer a cursor around with the D-pad. The map has two modes, one that lets you scroll around and one that shows mission locations, but you can’t do both at the same time for no reason whatsoever. Out in the overworld, you’re never informed when you’re within range of a mission – you’ll have to check the map screen, steer to the spot, check if you can launch subs yet, if not, adjust, back to the map screen and repeat. Graphics sell the underwater location reasonably well. Blue and brown are obviously overused, but ships are easy to make out against the background, there’s a nice shimmer effect and trailing air bubbles, and sunken ships and the like feel appropriately gargantuan. 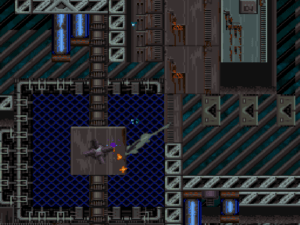 The only real complaint here comes with the game’s many drab colony levels – it’s difficult to tell what is a block of concrete and what is supposed to be in the background. This leads to a more than a few cases of having to feel around to find a path, but luckily your mini-subs take no damage from bumping into things. Switches similarly blend in, and you’ll need to know you’re looking for them to have any chance of spotting them. Audio is all variations of the SeaQuest theme, all the time. It gets tiresome, as you would expect. In the end, the SNES version of SeaQuest DSV is a case of good concepts and bad design. To be clear, the more grating aspects of the missions will still be completely present in the Genesis version, but the inability to restore your progress in the SNES version makes the challenge level simply absurd. It’s naturally the more colorful version, and the interplay between ships to solve puzzles is certainly neat, but the extreme trial and error required just doesn’t make this much fun. Tackle missions that are true to the first season of the show. Interplay between units with different abilities is generally handled well. Need to buy your own equipment, but money is reasonably easy to find. No mission passwords in the SNES version – failing any mission in a zone means restarting that entire zone. Puzzles are well designed, but the levels are large, confusing mazes. Ships don’t control well at high speeds. Far too much intentionally-designed trial and error. Woo, more SNES game reviews! This game looked kind of interesting but I’d heard bad reviews of it before. Though your review makes it seem more interesting in general (specifically the non-mission parts), but it sounds like its core game mechanic for the missions is pretty horrible (timer kills you, try that whole level again). Though even if the game wasn’t broken, I don’t think I could deal with the “go back to the entry point to switch vehicles” — I can’t even play Lost Vikings because I have to run three separate guys through the whole level. I’m curious to see how the Genesis version handles. Every button on the SNES pad was used, so I’m wondering how well that translates. But even with mission passwords, the sheer trial and error required is asking a whole lot of the player.